Slipped over in the restaurant? How much for a Holiday Claim? Have you been prescribed Metronidazole on Holiday? Holidaymakers who go away on holiday and fall ill whilst they are away are often forced to visit a doctor or pharmacy for treatment. Quite often the doctor or pharmacist will hand out a number of different types of drugs to treat the illness. But many holidaymakers are unaware or unsure of what these drugs actually are and the consequences of taking them. One of the drugs regularly handed out in destinations such as Egypt is Metronidazole. The drug Metronidazole belongs to a group of drugs known at antimicrobials. These types of drug are used to treat bacterial and protozoal infections such as Giardia and Cryptosporidium which are commonly contracted on package holidays abroad. Is Metronidazole safe to take? The drug must be prescribed to you by a qualified doctor and only in the event that you are suffering symptoms that feature in the above list. The drug is generally safe to use and is effective in fighting bacterial infections. However, the drug does have some side effects which could affect the taker and people should be aware of. Severe Side effects – swelling of the hands, feet, ankles, face, lips or throat which may cause difficulty in swallowing or breathing. Fever, stiff neck, headache, see or hear things that aren’t there, problems using your arms and legs, problems with speaking or feel confused. These could be symptoms of a serious but very rare side effect affecting the brain. stop taking immediately if you experience any of these symptoms. Yellowing of the skin and eyes or pale stools; these could be an indication of a liver problem. The list of side effects is something for holidaymakers to be aware of but the likelihood is that you will not suffer any of them. We would advise any holidaymaker that returns to the UK suffering with symptoms of severe vomiting, diarrhoea and stomach cramps immediately consult their GP as soon as possible to allow them the chance to identify the possible cause of illness. Correct and appropriate treatment can then be administered by the GP. If you were prescribed Metronidazole or any other antibiotic drugs whilst on your holiday then this could be a strong indicator that the illness you contracted was holiday food poisoning or some other bacterial infection. If you have suffered with illness whilst on holiday or on upon your return to the UK and you believe that your illness was contracted during the holiday, contact us today. Talk to our expert travel lawyers and see if you are able to claim compensation. 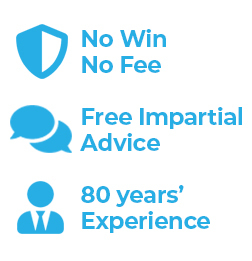 We act on your behalf on a no win, no fee basis. To find out whether you can make a 'No Win, No Fee' Holiday compensation claim and obtain free initial advice, contact us by telephone or use the online enquiry form on this page. © Simpson Millar LLP Solicitors 2010 . On Holiday Claims is a trading name of Simpson Millar LLP. Simpson Millar LLP is a limited liability partnership registered in England and Wales - Registration No: OC313936.